2018 smart EQ Fortwo is now available in Lynnfield, MA. Flagship Motorcars of Lynnfield is dedicated to bringing the very best automotive experience to North Shore drivers. That's why in addition to our Mercedes-Benz and Sprinter inventories, we also house a smart center! Featuring exciting new models engineered by Mercedes-Benz, our smart car dealership in Lynnfield, MA offers vehicles that are easy to park, easy on the environment and easy on your wallet! Available in both coupe and cabriolet models in EQ fortwo models, you’ll stand out on the road and as you cruise past the pump. 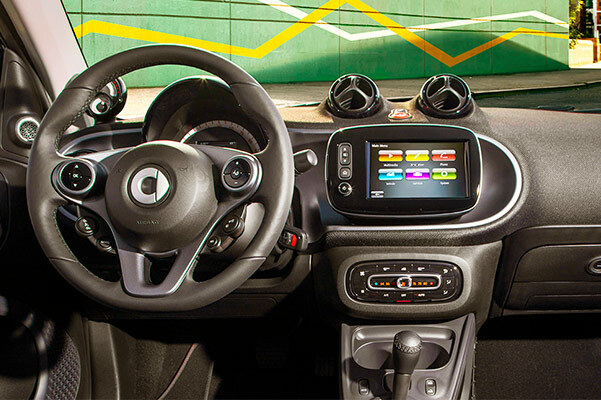 Both the smart EQ fortwo Coupe and Cabriolet provide Greater Boston drivers with high-tech interiors, customizable style and impressive electric performance. Whether you want to explore the city or escape it altogether, the smart EQ fortwo is up to the task. 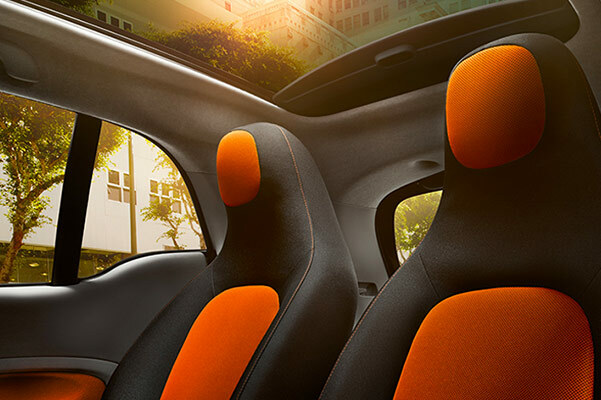 Despite the small stature of each smart car, every model offers a surprisingly spacious interior that will leave you comfortable on every ride. 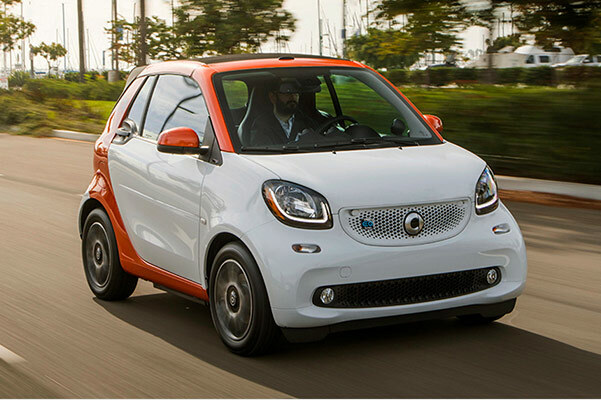 Plus, each smart car’s small size helps to improve its legendary efficiency. Thanks to Mercedes-Benz engineering, smart cars are tough and durable despite their size. The patented Tridion Safety Cell uses reinforced, high-strength steel to protect you and your passenger. Steel doors with spot-welded reinforcements mitigate damage from side-on impact, letting you drive with even more peace of mind. Connected. Automated. Shared & Services. Electric. 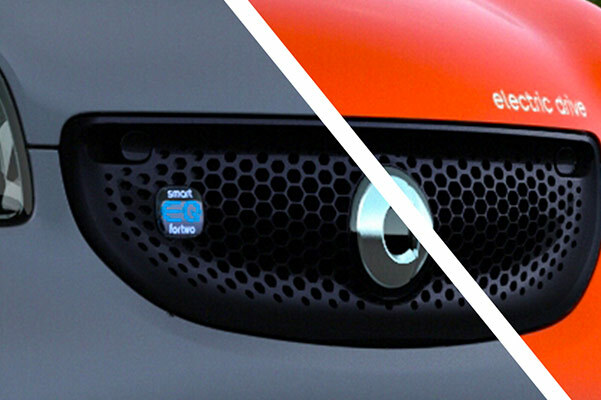 Those are the four pillars of CASE, and they’re imbued in the smart EQ fortwo, our most advanced vehicle yet. Want a glimpse into the future? 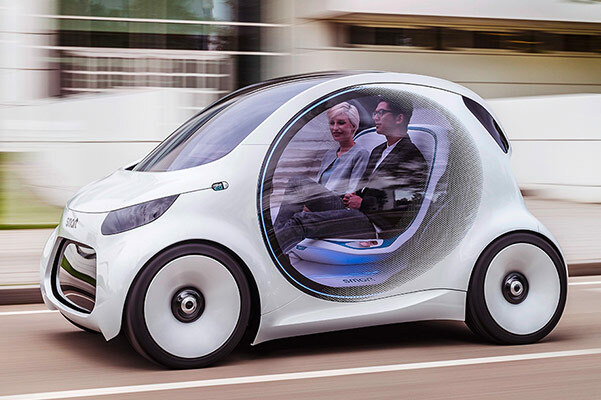 Look no further than the smart Vision EQ fortwo, a fully autonomous concept vehicle that could change the way we drive forever. Learn more here. smart cars come with impressive Mercedes-Benz technologies that protect you on the road. Crosswind Assist helps you compensate for gusts of wind with the help of ESP® sensors that can automatically trigger your brakes. A wide wheel base also helps you stay in control and makes for a sportier feel, while Hill Start Assist will help you conquer inclines. You're sure to enjoy the best-in-class turning radius that smart cars provide. With a turning radius of just 22.8 feet in the smart pure coupe, you'll be able to navigate parking garages, narrow city streets and busy parking lots with ease. Use the smart Direct-Steer system with variable ratios for added control. At only 8.8 feet long and 5.5 feet wide, smart was designed with the urban landscape in mind. Its small size makes it a cinch to parallel park on busy city streets. If you opt for the smart EQ fortwo, you get a Lithium-ion battery that helps to return 107 MPGe, taking eco-friendly instincts to the next level. Regenerative braking helps recharge your battery every time you slow down around a corner or stop at a red light. Best yet, you can plug your smart into any household socket using the on-board 110-volt charger. Use the Cross Connect app to drive smarter than ever before. This free app lets you view your trip history and "driving score," calculated based on factors like your average speed, fuel consumption and more. It can also provide turn-by-turn navigation, an online radio and parking memory. Driving smart doesn't mean driving boring. Treat yourself to available interior luxuries like heated seats, a JBL®* Sound System, Bluetooth®** hands-free calling with audio streaming, power and heated mirrors and more. Slide behind the wheel and it's clear that smart and Mercedes-Benz share the same DNA. Contact smart Center Lynnfield for this month's low lease special! Starting at $24,550 before Government Incentives! Before government incentives, the new smart EQ Fortwo starts at only $24,650 ($23,900 plus the $750 transportation charge to import from Europe). A $7,500 Federal Tax Credit^ is available for cash or finance customers until Mercedes-Benz sells 200,000 electric vehicles. After 200,000 electric vehicles are sold by Mercedes-Benz USA, LLC (smartUSA), the tax credit is gradually reduced each following quarter year. An additional $1,500^ cash refund may be available to Massachusetts residents who lease, finance, or pay cash for a 2018 smart EQ Fortwo. This $1,500 cash refund for Massachusetts residents is not related to taxes and is offered by the MA DOER and MA Clean Cities^. Until Massachusetts funds run out, an additional $1,500^ cash refund may be available to Massachusetts residents who lease, finance, or pay cash for a 2018 smart EQ Fortwo. This $1,500 cash refund for Massachusetts residents is not related to taxes and is offered by the MA DOER and MA Clean Cities^. Come and see the impressive inventory of new smart cars on our lot, from coupes to cabriolets that will let you feel the wind in your hair. Test-drive a new smart fortwo prime, passion or pure coupe to take advantage of an affordable ride that offers unrivaled efficiency, a cozy, tech-forward interior and a sporty feel. If you're not sure whether a smart car is right for you, let our experts learn more about your daily drives and what you use your car for most. If you're looking for the perfect place to service the smart car you already own, make Flagship Motorcars of Lynnfield your first stop. Our smart car service experts are fully equipped and have the experience needed to repair or maintain your smart car. With our convenient location at 385 Broadway, Route 1 North in Lynnfield, MA, it's easy to get to our smart car center from Peabody, Salem, Beverly and beyond. Get directions to our dealership here, then come by to explore the smart car that makes the most sense for your daily driving duties. ^The smart EQ Fortwo is eligible for both a $7,500 Federal Tax Credit & $1,500 Massachusetts MOR-EV cash refund. Consult your tax professional for information on your personal eligibility for the IRS Federal tax credit. General EV tax credit information provided by smartCenter Lynnfield does not constitute tax advice for your personal situation. Please also visit the MA DOER rebate website at https://mor-ev.org/to see if you are eligible for the $1,500 Massachusetts cash refund. The $7,500 Federal Tax Credit and the $1,500 MA DOER rebate are offered independently of smart Center of Lynnfield which can make no guarantee of your personally eligibility. *The JBL® trademark is owned by JBL Professional.